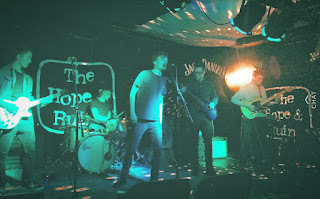 Kingpins are a Brighton-based five-piece who've already made an impression locally by selling out shows including a This Feeling night at the Hope And Ruin last weekend. Don't Go, one of only two tracks they've released to date, manages to channel their influences but crucially, in their approach and front man Henry's distinctive voice, distill them into something that makes them stand out from the crowd. With a whole load of new material written and ready to record, they're looking for a record label to take a chance on them. Kingpins are Henry Foulkes on lead vocals, Chris Udell on lead guitar, Joe Simmonds on drums, Sam Glinsman on rhythm guitar and Hayden Prenter on bass.